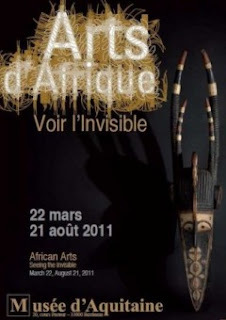 By bringing together over 200 extraordinary works of art - the biggest ever presented to the public - from major European public and private collections, the Musée d'Aquitaine offers an original reading of African creativity. Its report to the invisible, revealing a unique world view, is essential to understand and discover the wealth of past and present cultures of the African continent. These objects of extraordinary variety of shapes and functions, including the oldest dating from the 11th century (statue Soninke of Mali) and the production extended to the mid 20th century, are the direct operators of traditional authentic ceremonials, such as initiations (masks nature spirits, some with their ritual costumes), ancestor worship (protective statues, male or female honored on altars), magic or divination (fetishes defense or attack, the body charged with nails and "medicine"), that make them irreplaceable in African thought, as well as masterpieces of universal art.